Source of title proper: Title based on contents of the collection. 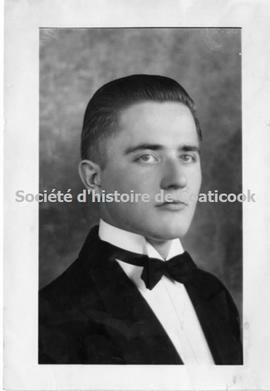 Ignace-Denis Telmosse was born in Montreal on 19 July 1889, son of Louis W. Telmosse and Lumina Perreault. Following the receipt of his doctorate in medicine in 1912, he settled in Coaticook in 1916. He practiced medicine in Coaticook until his death in 1955. Dr. I. Telmosse served as the first president of the medical office of the Centre hospitalier de Coaticook. Dr. I. Telmosse married Denise Dupuis (1898-1985) in 1917. Together the couple had ten children: Edmond (1917), Thérèse (1920-1990), Berthe (1921-2001), Suzanne (1923), Louis (1923), Mathilde (1924), Denise (1926), François (1927-1990), Marguerite (1930), and Roger (1932-2017). Edmond and Louis joined the clergy as Catholic priests. François and Roger followed in their father’s footsteps, becoming doctors. Thérèse married Dr. Gustave Gérin-Lajoie. Collection Telmosse presents information on members of the Telmosse family from 1905 to 1983. It consists of a family tree, school notebooks and papers, an invitation for the ordination of Louis Telmosse, a newsaper article on the work of Father Edmond Telmosse in Haiti, and three photographs. Rusted bindings have been removed.